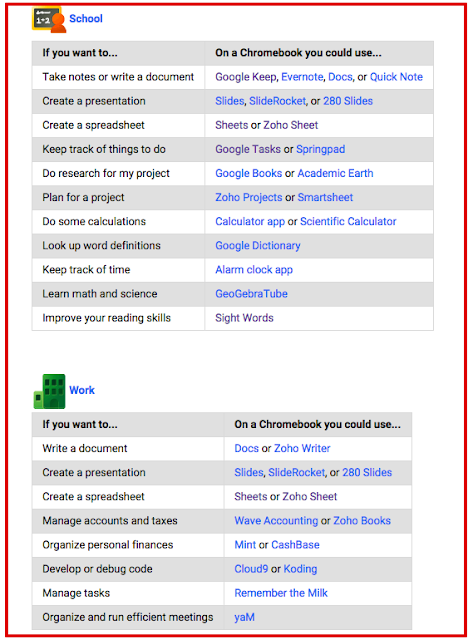 Chrome store is teeming with all kinds of educational apps to use on your Chromebook. However, searching for relevant apps can be a real arduous and time-consuming task. For those of you who are not conversant with how Chrome search works, Google has this excellent video tutorial to walk you through the process of searching for and locating chrome apps. Chromebook users looking for some very good apps to start with, Google has these handy lists of carefully selected apps. The apps are arranged into four main categories: pre-installed, everyday, school and work. You may want to book mark the page for later reference. Here is a snapshot of the apps listed in the school and work categories. Check the entire lists from this page.